In the beginning, there was Lyla El-Messidi, who organized the greeters table and report racks as the booth building began. Exhibitor's Party Revelry. 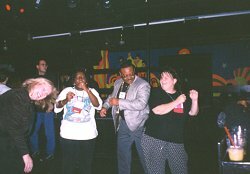 From left - Cynthia Lanius, Theresa Chatman, Doug Hewett, and Kathy El-Messidi. 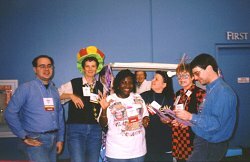 "Bonehead" Cherri Pancake, second from the right, SC97 Exhibits Chair, encourages the CRPC participants to join the "Battle of the Booth Bosses" at the Exhibitors Party, Sunday, Nov. 16. 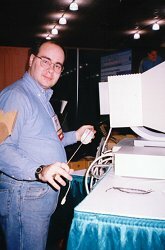 Logan Ratner, Rice, ponders the state of electricity at the CRPC Booth. 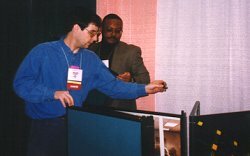 Chuck Koelbel and Doug Hewett, Rice, begin to build the panel displays in the booth. Logan Ratner gets us wired. Scott Klasky demos SciVis for a group of interested attendees at VIP night, Nov. 17th. 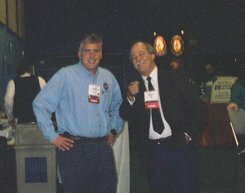 Alan Carle, left, and Chuck Koelbel, right help prepare the CRPC Booth, ViP Night, November 17th. 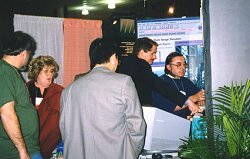 Danny Powell, right, Rice, introduces the CRPC Booth to a NASA visitor. ViP night, November 17th. 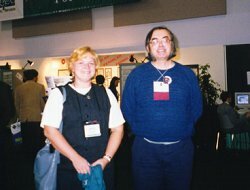 Tomasz Haupt, Syracuse University, demonstates WebFlow and HPF Interpreter to Barbara Chapman, University of Vienna, Vienna Center for Parallel Computing. 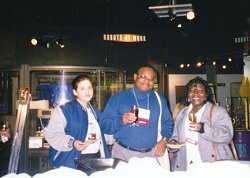 Booth helpers Lyla El-Messidi, Doug Hewett, and Theresa Chatman attend the Hewlett Packard Reception in the Technical Museum of Innovation. 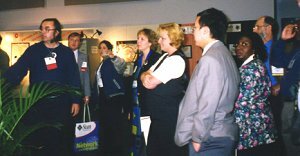 Mary Wheeler, left, University Of Texas, Ken Kennedy, Rice, and Geoffrey Fox, Syracuse, check out demos being prepared, ViP Night, November 17th. 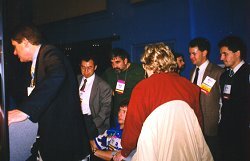 After attending a Tango demonstration by Geoffrey Fox, Deborah Risko is presented with a CRPC t-shirt. 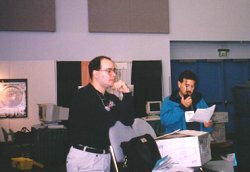 Left to right: Clint Dawson, Jeff Horner, Shirley Browne, and Phil Mucci from Tennessee prepare their booth demos. 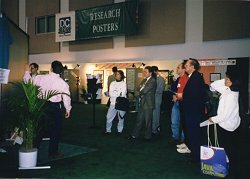 Ken Kennedy, Rice, listens as Geoffrey Fox, Syracuse, discusses a demo. 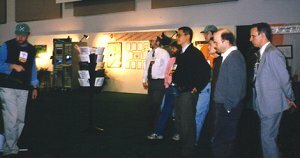 In the background, Mary Wheeler, University of Texas, asks questions of demonstrators. ViP night, November 17th. Jack Dongarra, University of Tennessee, presents a talk on SCALAPACK. Scott Klasky, Syracuse, talks about SciVis. 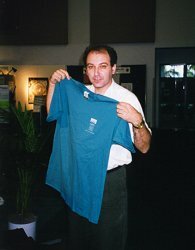 Dr. Ilya Zaslavsky, GIS Staff Scientist at the Education Center on Computational Science and Engineering at San Diego State University is happy to win a CRPC t-shirt. Dr. Zaslavsky appreciated Jack Dongarra's talk on Atlas and LAPack. Geoffrey Fox, Syracuse, presents his talk on WebWisdom. 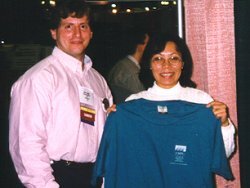 Scott Lasky, left, presenter from Syracuse University with CRPC t-shirt winner Anh-Thuy Nguyen of Sun Microsystems. 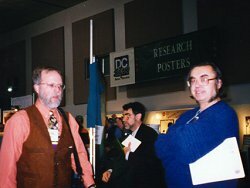 Lennart Johnsson, left, University of Houston, brings a visitor to the CRPC Booth. 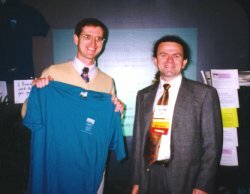 Geoffrey Sauerborn, left, a Mathematician with the Weapons Analysis Branch of the Army Research Lab was the first winner of a CRPC t-shirt during SC97. 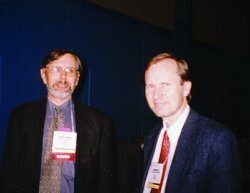 Geoffrey attended a presentation on ParkBench by Erich Strohmaier, University of Tennessee. Roman Markovsky, Syracuse University, prepares his demo. 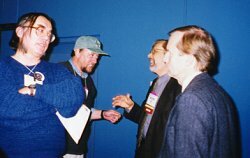 Geoffrey Fox, left, and Jack Dongarra, second from the left, talk with Lennart Johnsson and another booth visitor. Attendees view Jack Dongarra's presentation on ScalaPack. 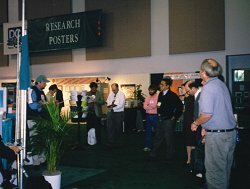 Dennis Eaton, Syracuse University, prepares his demo. Keith Seymour, University of Tennessee, presents "Netsolve." Dan Reed, University of Illinois Urbana-Champaign, asks a question during a Town Hall Meeting with the Sid Karin, Director of NPACi and Founding Director of SDSC, asks questions during a town hall meeting with the Presedential Advisory Committee on HPCC, IT, and NGI. Sid Karin, Director of NPACi and Founding Director of SDSC, asks questions during a town hall meeting with the Presedential Advisory Committee. 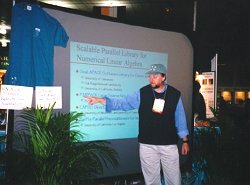 Jack Dongarra, University of Tennessee, presents a talk on LaPack and Atlas. 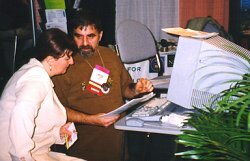 Geoffre Fox, Syracuse University, helps with a visitor to the CRPC Booth. 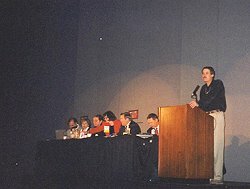 Ken Kennedy, CRPC Director and Co-Chair of the President's Committee on High Performance Computing and Communications, Information Technology, and the Next Generation Internet, leads a Town Hall Meeting on the committee's work.